During 4Q17, the yield rates of suppliers’ respective 3D-NAND processes climbed steadily, while smartphones remained the major demand contributor in peak season, according to DRAMeXchange, a division of TrendForce. As the result, only contract prices of eMMC and UFS products went up by 0-5% QoQ in 4Q17, but other major application markets such as PCs, tablets, and servers together with data centers showed weaker growth momentum. Their contract prices were either flat or fell by a small margin, and the market shifted toward an equilibrium of supply and demand. As for 1Q18, the market is currently experiencing a slight oversupply due to the off season effect. NAND Flash suppliers will see their revenue performances suffer as they cut prices on their products to spur demand. However, they can still maintain a healthy level of profit because their costs of 64- and 72-layer 3D NAND solutions have also shrunk. Samsung’s 4Q17 NAND Flash bit shipments grew by 10% QoQ on the back of demand from the smartphone and the server/data center markets. The supplier also saw rising ASP in the same period. On the whole, Samsung’s NAND Flash revenue for 4Q17 totaled US$6.17 billion, showing a QoQ increase of 9.8%. Samsung’s product strategy in 2018 consists of accelerating the launch of flagship models with higher storage density, expanding the adoption of high density storage and uMCP for mid-range and entry devices, and promoting high-density enterprise SSDs featuring PCIe and NVMe interfaces. In the near future, the company’s NAND Flash business will depend on the rapidly growing server/data center market for maintaining high revenue growth and high gross margin. SK Hynix posted a QoQ growth of 16% for its 4Q17 NAND Flash bit shipments. The increase was attributed to orders related to the latest iPhone devices and flagship smartphones from Chinese brands. SK Hynix has also improved its product strategy, leading to a 4% QoQ rise in the ASP. Revenue-wise, SK Hynix registered a 19.5% QoQ increase to reach US$1.8 billion. As for SK Hynix’s product strategy going forward, its sales will still focus on MCPs and the demand of NAND Flash from iPhones. The supplier should be able to increase its bit shipments as average storage capacities of smartphone expand. On the other hand, in the SSD market, SK Hynix hopes that its maturing 72-layer 3D NAND technology will help drive sales of its PC and enterprise SSDs during 2018. Toshiba’s NAND Flash bit shipments continued to grow in 4Q17 because of the focus on supplying memory products for new iPhone devices and PCIe SSDs. On the whole, Toshiba’s NAND Flash revenue for the quarter rose 1.4% QoQ to US$ 2.78 billion. Toshiba’s primary objective for now is to increase the overall NAND Flash wafer input and raise the yield rate of its 64-layer 3D-NAND process. Regarding new capacity planning, the 3D-NAND capacities of Fab 6 and Fab 7 are expected to become available in 2019 and 2020 respectively. Sales of Western Digital’s NAND Flash products were strong in 4Q17. Besides the surge of consumer demand in the year-end holiday season, the strategy of selling products under various brands together with the release of competitive 3D-NAND products also contributed to Western Digital’s success in the retail market. 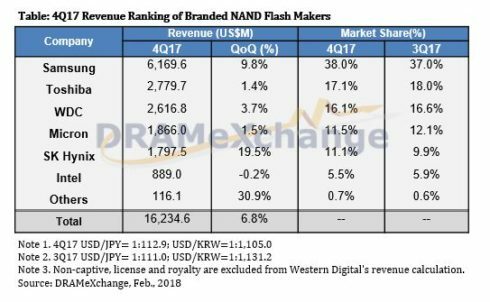 On the other hand, as SSDs gradually become more mainstream in the notebook PC market, Western Digital’s NAND Flash business will continue to perform well. For the entire 4Q17, the company’s NAND Flash revenue totaled US$2.62 billion, an increase of 3.7% from the previous quarter. Micron posted significant revenue gains in the server/data center market during 4Q17. At the same time, however, the supplier lost grounds in the channel market (for both chips and wafers). As a result, Micron posted a small increase of 1.5% QoQ, amounting to US$1.87 billion. Micron’s strategy is to wholly concentrate on expanding its capacity for 64-layer 3D-NAND chips with the expectation that their share in the supplier’s total NAND Flash output will exceed 50% in 2Q18. Micron will also expand shipments of SSDs for server/data center and PC, and also accelerate the sampling process for its mobile products, hoping its profit will continue to go up. Intel’s 4Q17 NAND Flash revenue totaled US$889 million, which is comparable to the result of 3Q17. The robust demand for Enterprise-SSDs and the growing share of high-density products in total sales helped Intel in the final quarter of 2017. On the other hand, Intel’s overall cost structure was much leaner in 4Q17 due to the deployment of the 64-layer 3D-NAND technology. The company’s non-volatile memory business therefore managed to record a profit in the quarterly period for the first time in 2017. As for Intel’s roadmap, the supplier first develops enterprise SSDs with 64-layer 3D-NAND architecture to improve the cost structure, and then puts focus on storage products of higher density specifications. It continues to expand the product lines, hoping to maintain its leadership in the market for SSDs used in servers and data center equipment by following these strategies. At the same time, Intel is continuing to establish its presence in the PC SSD market and intends to maintain YoY shipment growth for 2018. As for 3D XPoint, potential applications will depend on the actual market arrivals of storage products based on Samsung’s Z-NAND and Micron’s QuantX. The prices will have to be more competitive before the pace of adoption picks up.